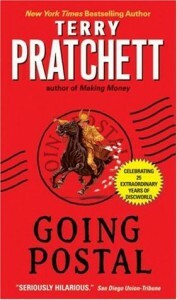 If you're Pratchett's fan, you gonna love this book regardless what I write. I really enjoyed this one. The author's sense of humor is brilliant. The story tells about a con who convinced to death didn't die. To live he needs to agree to take part in the operation post-office. And he agrees. Then the whole action begins. I thing this is one of his best book. Even if you don't like fantasy you need to try it a go. I'm sure you'll find in interestingly funny, if I may say so. Four stars from me.